The couple knew they had the potential to build a home that could embrace both their family and their lifestyle. And they knew the architect who could create their idyll. Kate can’t rave highly enough about Bayden Goddard of BGD Architects. “Bayden had done a friend’s house so we were aware of his work already. But once I met him, I just knew he was the right architect for us.” It was a perfect match, as Bayden agrees. 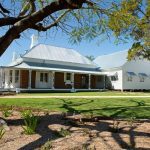 The couple knew they had the potential to build a home that could embrace both their family and their lifestyle. And they knew the architect who could create their idyll. Kate can’t rave highly enough about Bayden Goddard of BGD Architects. “Bayden had done a friend’s house so we were aware of his work already. But once I met him, I just knew he was the right architect for us.” It was a perfect match, as Bayden agrees. “Kate and Price were a pleasure to deal with. Kate has an amazing eye for detail and, as tacky as it may sound, the project really was a meeting of minds.” A talented interior designer with her own business, Cove Interiors, Kate was able to inject a relaxed coastal-inspired style into the interiors that would highlight the home’s impressive indoor/outdoor design. 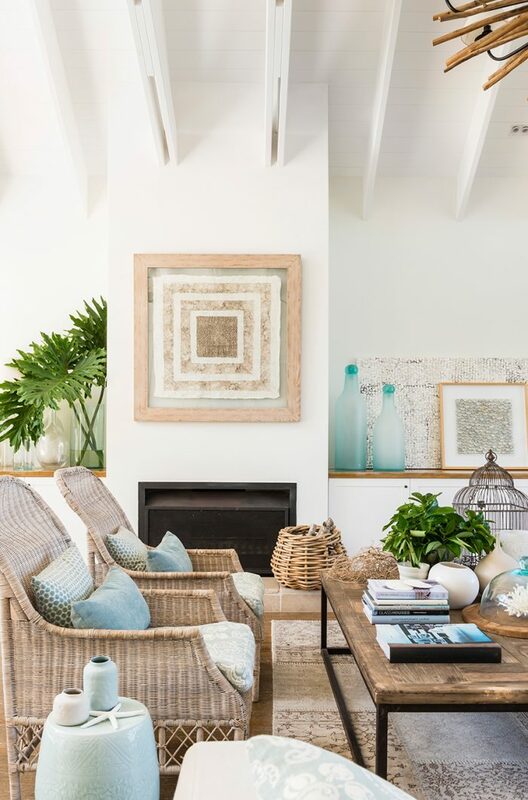 “I’m really inspired by designers like India Hicks, and we wanted a bit of a colonial Caribbean feel – almost like Cape Cod meets Noosa. 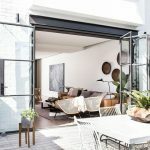 Construction took 14 months but it was a process made smooth and easy for Kate and Price, who say any anxiety was relieved simply by having the expertise of Bayden and his team. 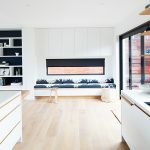 “I don’t think we would have ended up with the quality of home that we have without him being here on site like he was, to see it through from start to finish,” attests Kate. The stunning architectural details of the family room, just off the entrance hall with views out over the pool and pavilion lounge beyond, sets the scene for a home that invites you to step inside and relax. 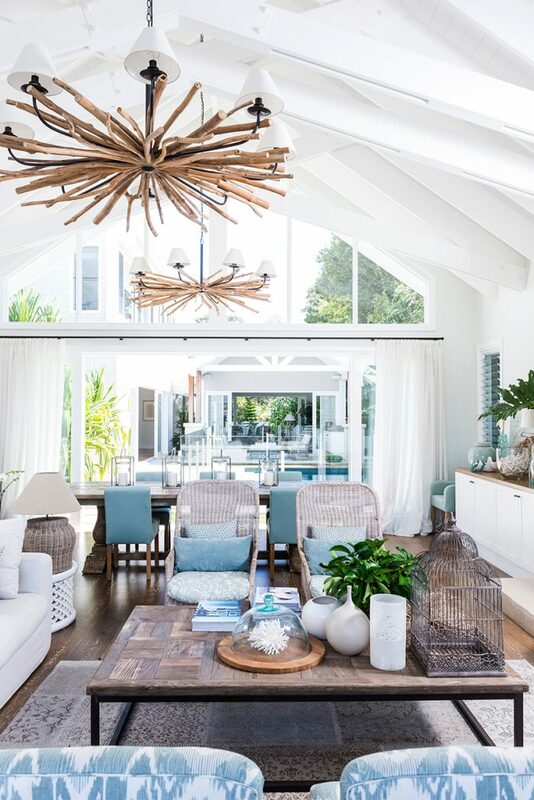 High ceilings give the space a feeling of vastness, adding great ventilation and natural light that makes it the ultimate summer retreat. 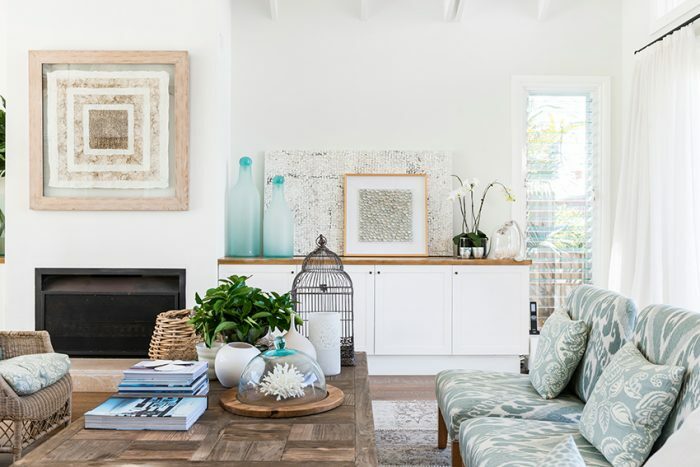 “We also love to use this room in winter, when we can light the fire up,” says Kate. 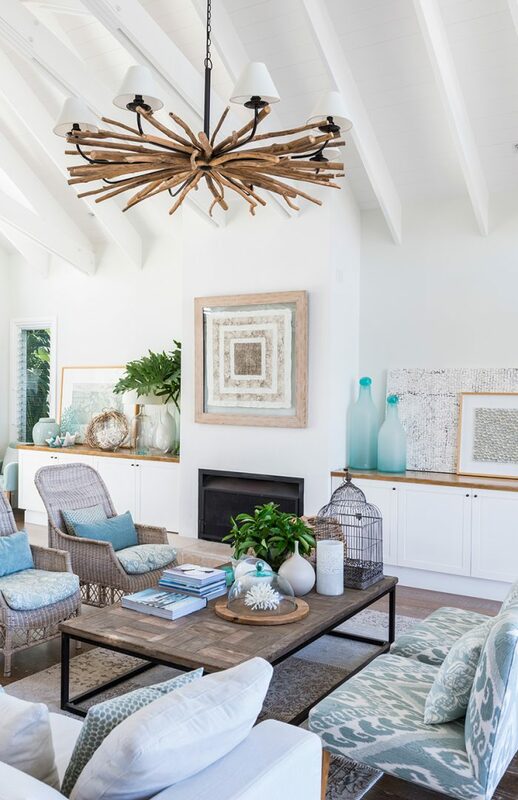 Two impressive twisted driftwood chandeliers from Hermon & Hermon dominate over the stripped back colour palette of powder blues and sea greens mixed with the rustic touches of timber and stone. 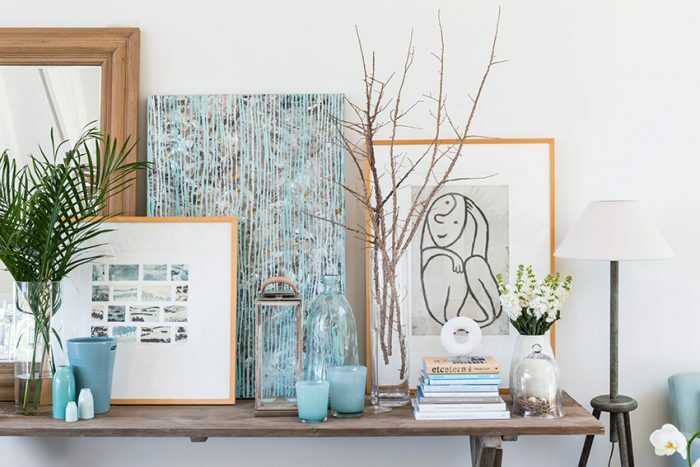 Picture perfect vignettes of natural corals and glass vessels sit beside textured, earthy ceramics and designer tomes, while art sourced from Signature on Hastings in Noosa includes contemporary abstract paintings by local artist Isabel Lawrence alongside shell studies by Jos Law and intricate etchings by Robyn Rayner. And then there’s those amazing timber floors. 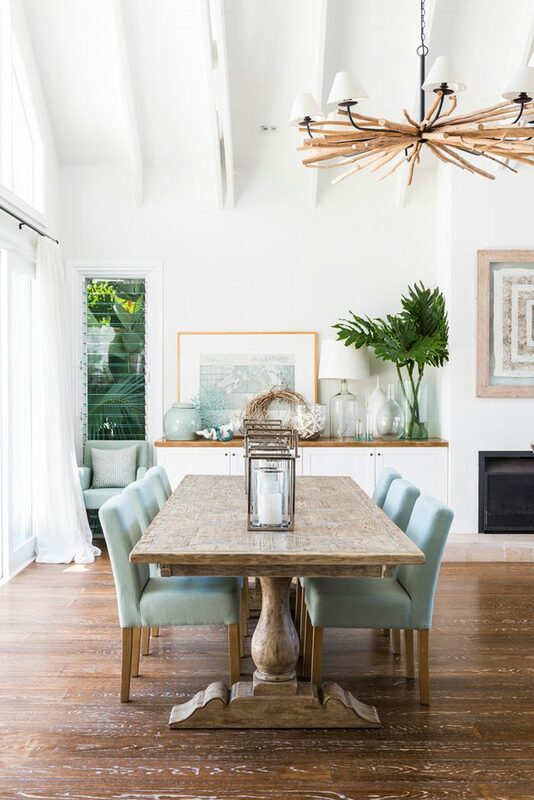 “The floors were my big baby,” Kate says proudly when we admire their beauty – American Oak, stained and lime washed in situ. 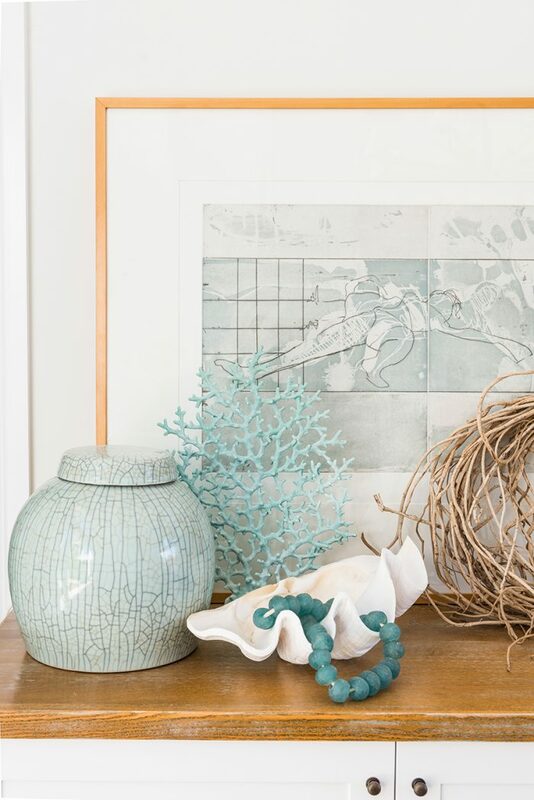 They’re a fitting statement in a home that is all about classic coastal style. 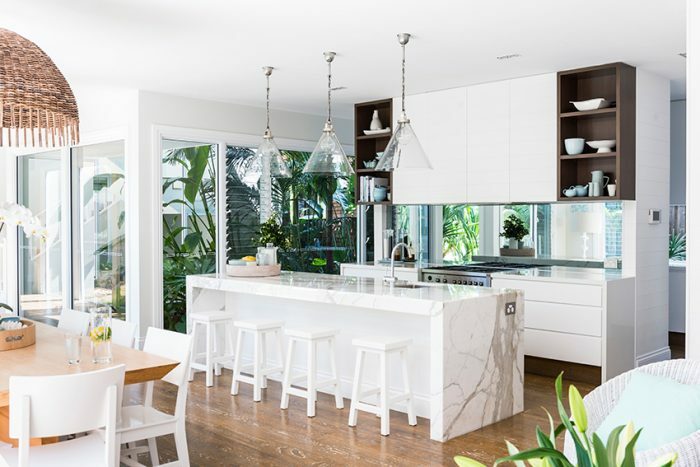 Head through to the kitchen and it is the beautiful use of marble bench tops and mirrored splash back, offset by a set of three chic glass pendant lights, that offers up effortless sophistication. 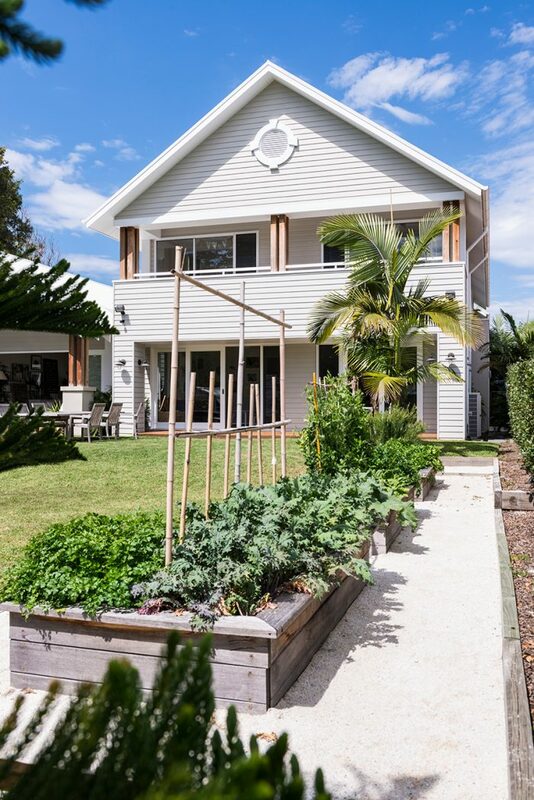 It’s here that Kate can whip up a feast (with produce plucked fresh from the overflowing veggie plot in the backyard) whilst easily entertaining friends or keeping an eye on the kids playing in the pool just outside. A favourite painting by Craig Panarby takes pride of place in a more casual lounge setting nearby, while glass louvred windows offer glimpses of the lush garden and through to the timber staircase that leads to the luxuriously appointed sleeping quarters upstairs. Another spacious room at the rear of the home leads out on to the huge backyard, and it’s here that Kate has had a little fun with the furnishings, bringing in tropical touches like palm tree printed cushions, vintage timber oars, evocative artworks and prints and that tropical staple, a pile of coconuts. With four young boys, Kate and Price could have their work cut out for them to maintain such a pristine, stylish home. Yet it’s Bayden’s clever use of spatial generosity and that indoor-outdoor design that will continue to allow for a free transit of toddlers through to teens. 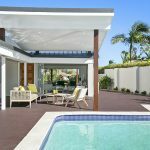 A huge backyard offers ample adventure time, beckoning you outside to take a seat on one of the Adirondack chairs, cool drink in hand, to chill out while the kids play wild and free. 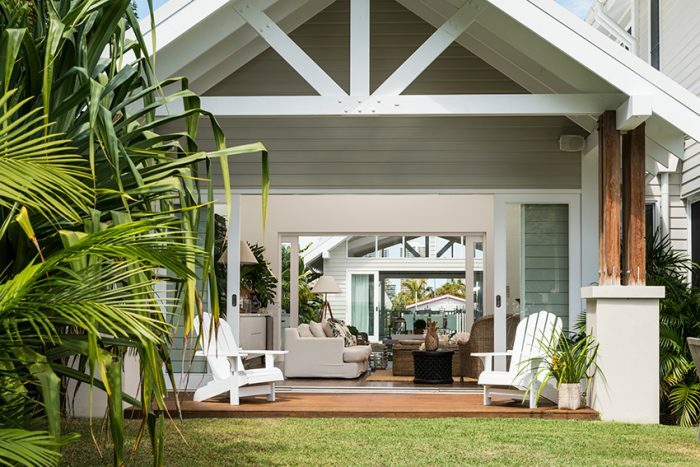 It’s a home that has captured that much sought after Gold Coast lifestyle that so many families dream of – a beautiful escape where both parents and kids have the space to laugh, to play and to relax. 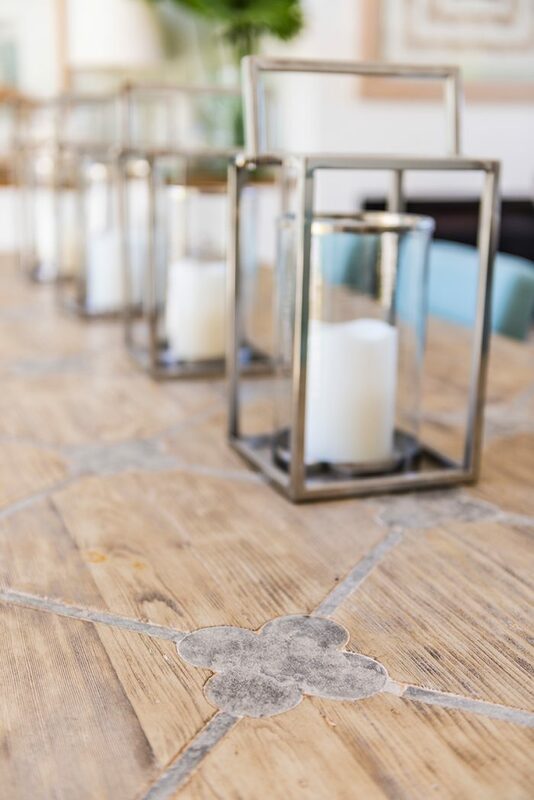 Discover more from Cove Interiors. 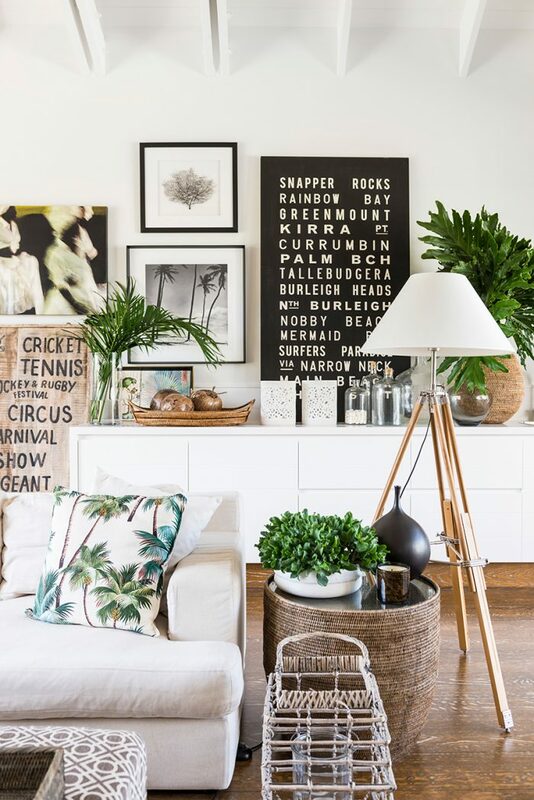 As seen in Queensland Homes summer 2014/15.